On November 13, Automotive Display Development Technology and Commercialization Planning seminar was hosted by Educational Center of Future Technology in Yeouido, South Korea. KATECH (Korea Automotive Technology Institute)’s Dr. Sun-Hong Park explained that “as the automotive display market grows, display market’s domain is expanding” and announced “market for CID (Central Information Display) that mainly functions as navigation device and HUD (Head Up Display) that can show mileage and speed is steadily growing since 2008 and it is anticipated to grow considerably in future”. He added that particularly, 7inch or larger CID is increasing its market share in display market and that CID is becoming larger. He also mentioned that with the increase of traffic accidents from driver’s lack of attention to the road, HUD that can show information on the front window is necessary. However, legibility issues due to brightness and reflectiveness and technological issues such as integration with other display device need to be solved. Dr. Chi-Sun Hwang of ETRI (Electronics and Telecommunications Research Institute) compared display technology that can actualize transparent display, and technological issues to be solved in order for it to be applied to automotive. Hwang explained that although display technology that can produce transparent display include LCD, OLED TFEL (thin film EL), HUD (projection) among others, AMOLED is the most suitable considering resolution and transmittance. Although LCD technology level is at commercialization stage, as the transmittance is not high it can interfere with the driver’s viewing field. He also added that “poly Si TFT technology performance is good, transmittance is limited. However, oxide TFT technology’s transmittance is high and performance is continuing to improve, it needs to be more actively developed”. To be used as an automotive display, it has to meet certain conditions such as temperature, production cost, and brightness to be an automotive component as well as being placed in the suitable location in the driver’s viewing field; compared to other general display, automotive display is facing higher number of technical issues. With the focus on the transparent display from automotive display industry, the interest in the technology needed for the application to automotive is also increasing. In order to lead the automotive display market, understanding of automotive components’ characteristics and effort to solve the diverse issues facing the optimized driving condition are required as well as knowledge of display itself. On October 15, in IMID Exhibition Business Forum held in Korea International Exhibition Center (October 14-16), KATECH (Korea Automotive Technology Institute)’s head of Intelligent Control System R&D Center Dr. Inbeom Yang presented ‘Future of Automotive Technology and the Role of Smart Display’ and forecast the future of automotive display. Dr. Yang revealed that “if existing vehicles focused on technological factors, future vehicles will evolve entirely centering on the driver, and the automotive display also will develop following this trend”. He also added that the driver’s safety and convenience have to be the priority. Dr. Yang gave 4 examples of future automotive display. Firstly, he discussed ADAS and their flaws. ADAS (Advanced Driver Assistance Systems) help the driver to operate the vehicle safely. If ADAS can be actualized through displays such as HUD (head-up display), the driver’s safety can be maintained with ease. The second item mentioned was a function that notifies the driver status reports linked with time and location. Dr. Yang reported that a device needs to be developed that can function in specific situations with sensors and sounds as well as on display. Dr. Yang forecast that if display, touch technology, and haptic technology are combined and applied to vehicles, operation and feedback will be simpler for the driver. He announced that multi-functional & configuration display will also be introduced which will allow driver to recognize and control. Audi’s concept vehicle that was presented in IAA 2015 Audi e-tron quattro has full OLED interface and all functions required for the vehicle operation can be controlled via touch display without physical buttons. As futuristic displays such as these are developed that increases driver’s convenience, the proportion of display within a vehicle is expected to increase, and developed focusing on the driver centered UI (user interface). OLED Display can maximize the driver’s accuracy with fast response rate and high contrast ratio. Along with safety, and design freedom that comes with flexibility, it is suitable for automotive display. However, the linkage with the UI system optimized for the driver is essential rather than performance of the display panel itself; collaboration between display panel companies, and automotive system and peripheral companies is expected to be a major point in early market occupancy between automotive display panel companies. On 19 August at IMID 2015 (August 18 – 21), a keynote speaker Munhyun Kim of Hyundai Motors forecast that automotive display market will become more active, digitalized, and simplified. 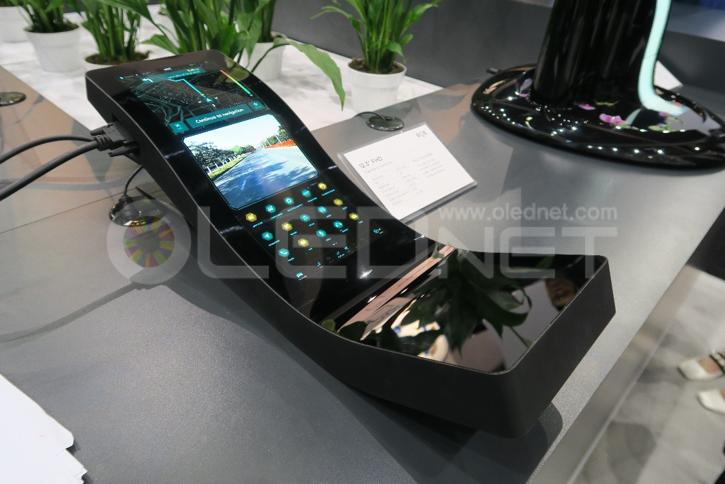 Kim categorized automotive display applied sectors into 4: cluster, HUD (head-up display) and CID (central information display), and RSE (rear seat entertainment). Kim revealed that technological trends of cluster are full color, high resolution, and customizability, particularly it can be customized to suit the user through diverse modes. Full color, high resolution, and AR (augmented reality) are the main trends for HUD. Distance guide, direction guide, and lane guide were suggested as examples of AR. CID’s main technological trends are integrated display and insertion of diverse functions. OLED applied CID is being researched. Enlargement, individuality, and mobility were mentioned as technological trends of RSE. Kim revealed that compared to automotive market which records 3-6% of growth each year, cluster and CID are forecast to grow by 10% a year. He added that although the weight of automotive LCD within the total LCD market is slight, the automotive OLED’s importance is forecast to grow to record 30% or over in 2017. In the past, 4inch or larger display were mainly installed in vehicles, but it is estimated that small display of less than 4inch will be increasingly introduced. Kim also added that he expects automotive display in diverse shapes and forms will be applied in future. 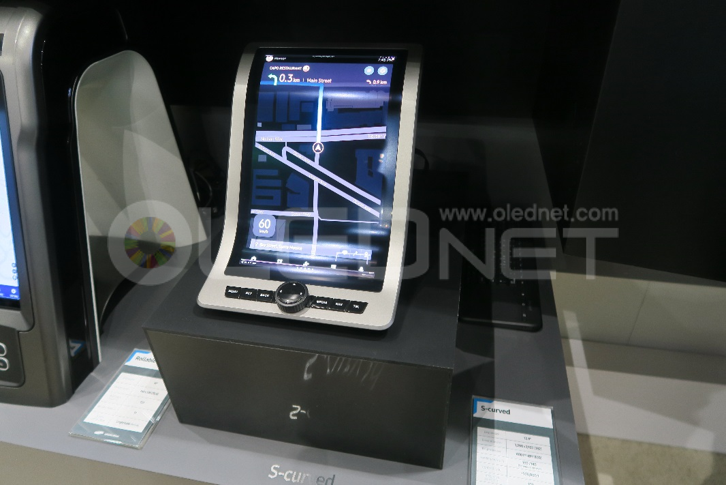 In CES 2015, Hyundai Motors exhibited AR grafted HUD, 3D-gesture control technology, wearable devices connected to the vehicle, next generation infortainment technology, and ADAS (advanced driver assistance systems). Kim expected the OLED display application will actively occur in the order of cluster, HUD, CID, and entertainment display. 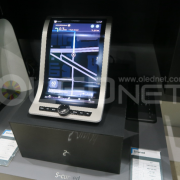 He also evaluated OLED panel that can easily actualize flexibility higher than LCD panel. 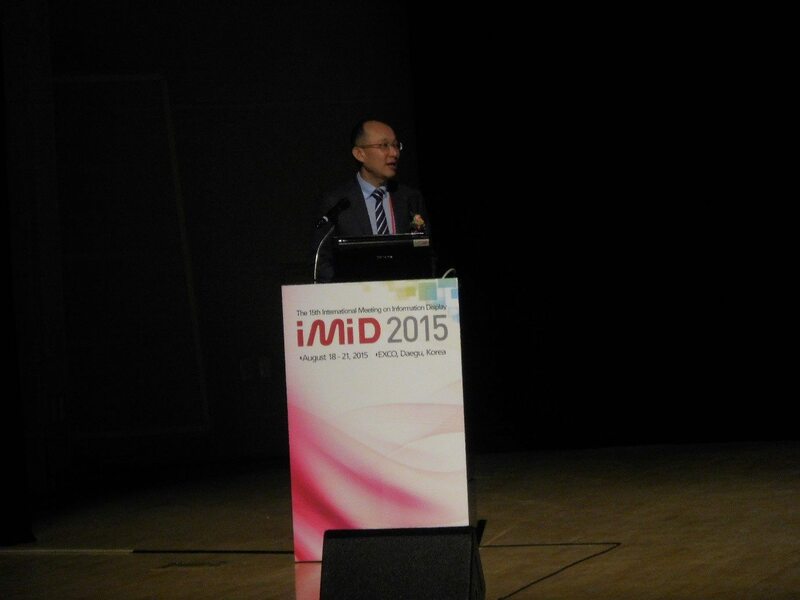 At SID 2015 Review Workshop held in Konkuk University on July 31, Inha University’s Associate Professor Jae-Hyeung Park announced that interest in HUD (head-up display) and HMD (head-mounted display) increased at SID 2015. HUD signifies technology that provides diverse information for the driver beyond the role of a front glass that simply allows the outside to be viewed and provides protection. Through HUD, drivers can grasp vehicular and destination information without having to take eyes off the road. At this juncture, AR (augmented reality) HUD is more than a simple display as it recognize the user’s movements and applies it to the display. In SID 2015 paper, Japan’s Ricoh termed the device that self-intervenes in the vehicular operation as ADAS (Advanced Driving Assistance System) and announced that the information from the device applied to HUD will be able to help the user’s recognition and decision making. It was also added that improved AR can be realized when the contrast range is increased to be equal to reality and reiterated and the distance from the virtual image is 5m. HMD, as a head-mounted device, provides differentiated feelings of immersion compared to other displays. Due to the increased realism from the wide viewing angle, HMD was widely used as an entertainment display, but with the recent increased interest in AR, it is receiving much spotlight as an AR display device. At SID 2015, the West Saxon University of Applied Sciences of Zwickau revealed an HMD device that actualizes AR naturally by changing the distance where image is shown according to the use by adjusting the focal distance. Zhejiang University’s college of Optical Science and Engineering used method of showing hologram to each user’s eyes using the light field concept that realizes the light strength to all directions from all points in 3D and produced improved AR. 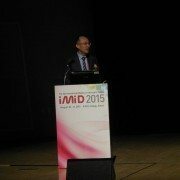 Park explained that with SID 2015 as a starting point, the AR related HMD and HUD interest and research will increases greatly and that the trend will continue in future. Samsung Electronics released HMD device Samsung Gear VR that can be used by plugging in to Galaxy S6 or Galaxy S6 Edge. Oculus VR and Sony Computer Entertainment each revealed OLED applied VR headset Oculus Rift and Project Morpheus, and scheduled release regular product in Q1 and H1 of 2016 respectively. Korea’s HLB released AproVIEW S2 which used virtual image distance actualization method, a first for HUD.